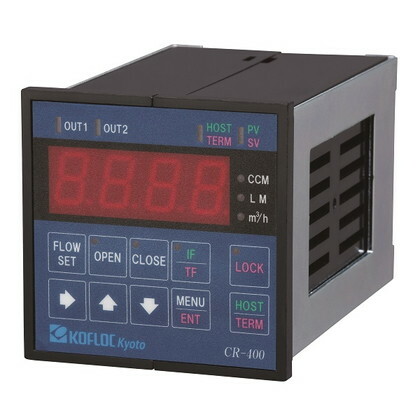 The CR-400 readout unit, when connected to your mass flow control-ler or meter with a cable, provides the key mass flow functions, such as flow measurement and control as well as cumulative flow calcula-tions and flow event outputs. This readout unit offers RS-485 commu-nications capability, so multiple readout units can be controlled online by a host computer. * The CR-400 is fully compatible in size with the CR-300. ・Total flow is displayed in 8 digits: The upper 4 digits and the lower 4 digits are shown alternately. ・Various event outputs are available. ・With a width of 73 mm and height of 73 mm, it takes up little space. ・Equipped with forced open/close operation of mass flow controller valve. ・External control terminals are provided on the rear for remote control. ・A lock key prevents accidental operation.